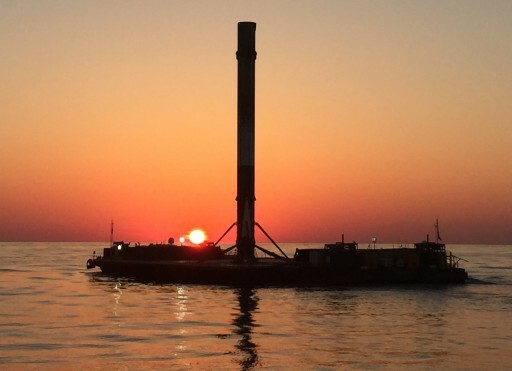 Standing tall in the center of the Drone Ship, the booster pulled into Port Canaveral Monday night and was hoisted from the steel deck on Tuesday to become the third in SpaceX’s inventory of returned rocket stages. Beginning with last December’s historic landing of a Falcon 9 booster at Landing Zone 1, SpaceX made continuous progress in the company’s aspirations of routinely re-launching Falcon 9 cores to drastically cut the cost of launching payloads into space. 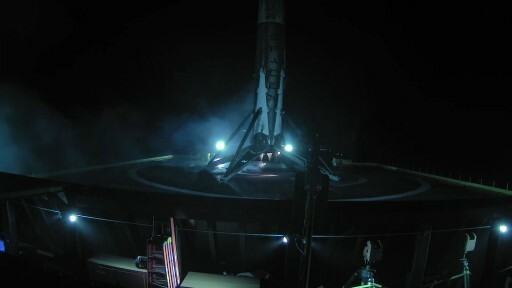 Although the first attempts were classed as experimental objectives, a large amount of attention was placed on SpaceX’s initial attempts of soft-landing Falcon 9 first stages in the ocean before upgrading to landing on the Autonomous Spaceport Drone Ships and Landing Zone-1 south of SpaceX’s launch complexes at Cape Canaveral. For all missions, the delivery of the payload remains the primary objective. 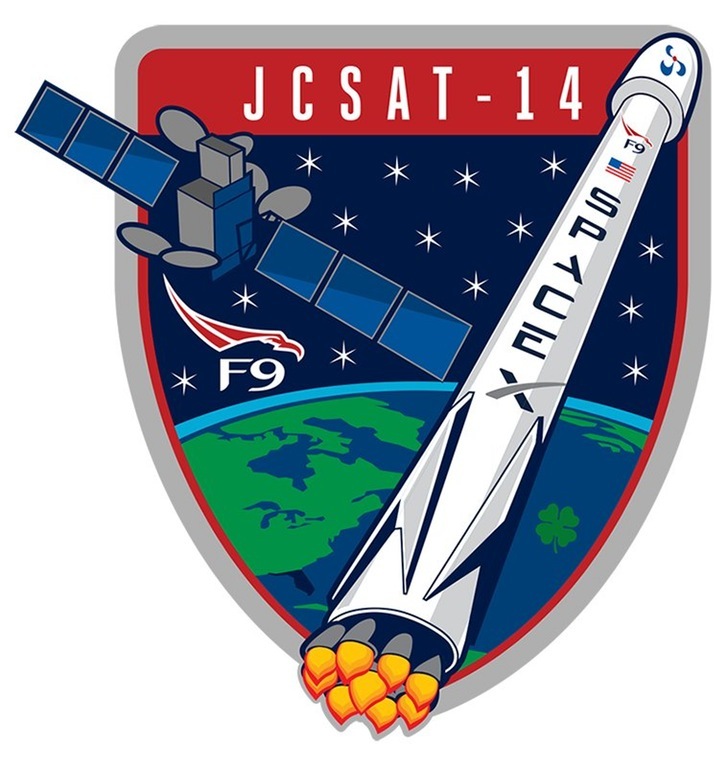 For the F9-024 Falcon 9, the primary mission was lifting the JCSat-14 communications satellite to Geostationary Transfer Orbit, requiring much of the launcher’s available performance and cutting fuel margins for the landing to a minimum. 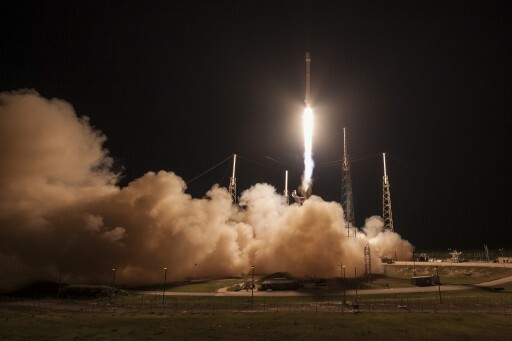 The two successful landings in the December delivery of 11 Orbcomm Satellites and the Dragon SpX-8 mission in April had the luxury of a vast amount of excess propellant – allowing a more controlled descent of the first stage to its landing site. 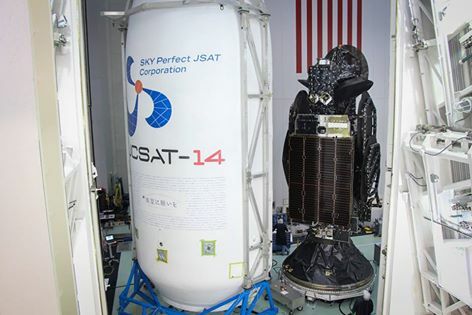 Devoting much of its performance to the primary mission when lifting JCSat-14, the first stage fired its nine Merlin 1D engines for two minutes and 38 seconds, accelerating the vehicle to a speed of Mach 6.8 and sending the second stage on its way. Firing up its MVac engine for a pair of burns, the second stage boosted JCSat-14 into a highly elliptical orbit and released the 4,700-Kilogram satellite 32 minutes after liftoff. Dropped off in a good orbit, JCSat-14 checked in with ground stations a short time after launch and was confirmed to be in good health. The satellite began post-launch maneuvers on time and is currently in the process of transitioning to Geostationary Orbit to expand broadcast and networking services in the Asia-Pacific Region. After arriving at its orbital position of 154°E, the satellite will complete final deployments and undergo checkouts before manufacturer Space Systems Loral hands operation of the satellite over to Sky Perfect JSAT. After dropping away from the second stage, the Falcon 9 booster was set for a particularly hot re-entry. Because of the tight propellant reserves the booster could not conduct a boost back maneuver and did not slow down for re-entry. Re-Entry was preceded by the usual flip maneuver to allow the first stage to point its engines forward followed by propellant settling and a short 15-second re-entry burn with three engines to slow the stage down and shield the aft section from the most extreme environments. Blazing through the atmosphere for over a minute and a half, the first stage used its four actuated grid fins to home in on the precise coordinates of the Drone Ship which was holding position with its four large azimuth thrusters. The SES-9 booster in March also made it to this point in a similarly challenging mission in terms of leftover propellants and re-entry energy. However, the SES-9 mission did not see a successful landing due to propellant running out in the booster’s three-engine landing burn – a particularly difficult maneuver necessary for missions with limited propellants available for landing. The SES-9 mission left the Drone Ship with a visible scar when the booster punched a sizeable hole in the steel deck structure. 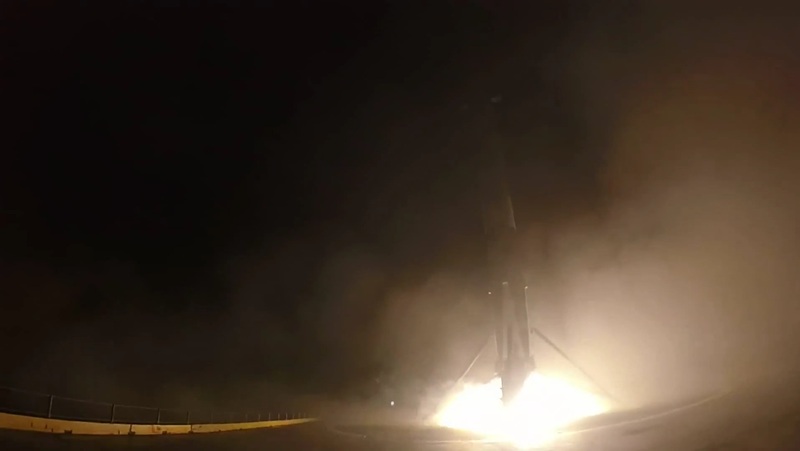 For last week’s return, SpaceX CEO Elon Musk upped the odds to a 50/50 chance of achieving a successful recovery – again involving a three-engine landing burn beginning just ten seconds prior to touchdown. After an initial burn of three engines to slow down from a fast dive, the two outer Merlins were shut down and the center engine was left on for the final landing maneuver. The booster came to rest on its four landing legs eight and a half minutes after liftoff to mark another milestone for SpaceX as core returns for high-energy missions are a critical requirement for the company’s business model of regular re-use of boosters. 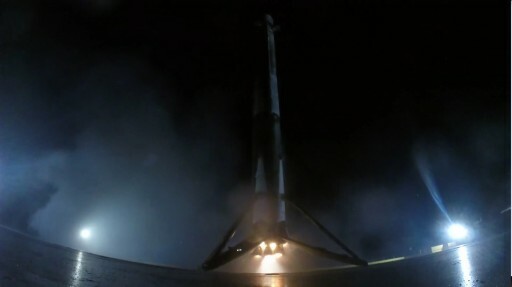 A small fire at the base of the rocket persisted for several minutes after landing, but was not deemed a concern and teams put the booster through safing steps under remote control before allowing personnel back on the Drone Ship. 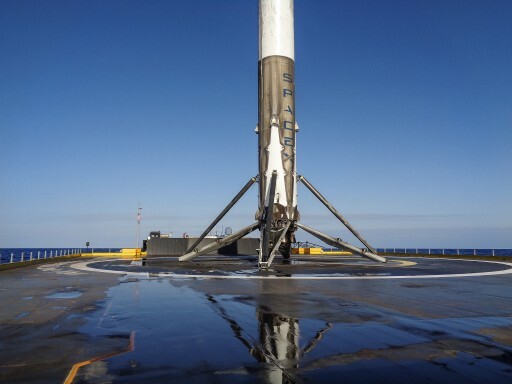 With Falcon 9 secured on the deck with metal chains, the Drone Ship and its support vessel began the trip back from the landing site 660 Kilometers south east of Cape Canaveral. Negotiating around Cruise Ship traffic at Port Canaveral, the Drone Ship sailed through the canal in the overnight hours on Monday before reaching its dock. This is the second core stage to arrive in Port Canaveral after the successful SpX-8 recovery that also proved the ground processing procedures of removing the booster from the ship, placing it on a stand, demating the landing legs, removing any hazardous substances from the vehicle and finally rotating it to a horizontal position for the move to a storage facility. With the procedures successfully shown for the SpX-8 booster, it can be expected that the F9-024 vehicle will spend less time at the dock as the processing operation gets more streamlined for this and future vehicles. 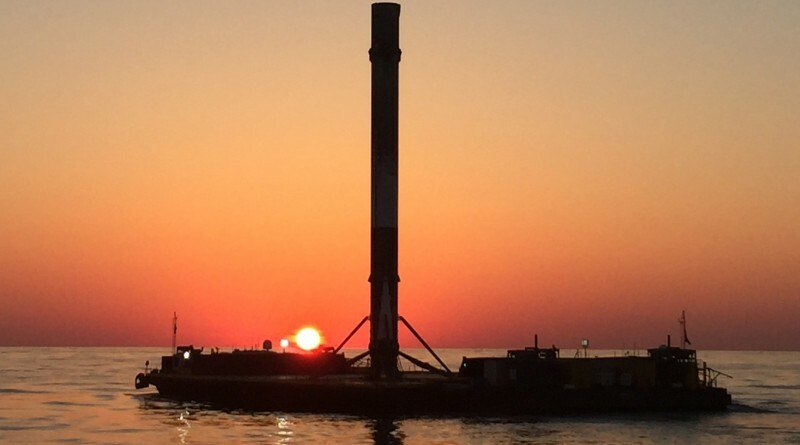 Greeted by a colorful sunrise, Falcon 9 was looking forward to a full day of operations starting with a short crane ride from the Drone Ship over a to the processing stand where the legs will be removed and final safing will be completed. The stage will then be moved via road to the Horizontal Processing Facility at Launch Complex 39A that is currently serving as a storage facility for returned Falcon 9 stages. At the 39A HIF, the booster will join those from the successful land-based landing in December and the first intact touchdown on the Drone Ship. The OG2 core, currently with some of its engines removed, is looking forward to travel back to where it was built to be put on display in front of SpaceX Headquarters in Hawthorne, California. 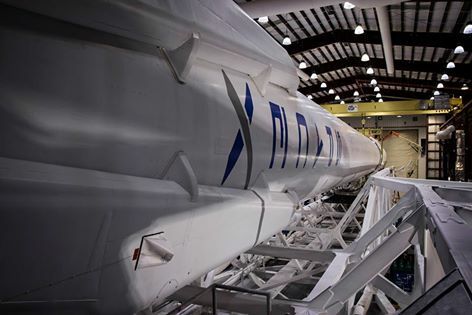 The future looks more exciting for the SpX-8 core, currently awaiting a trial by fire – to be re-fired for up to ten Static Fire Tests either at SpaceX’s Cape launch pads or the McGregor test facility ahead of a prospective re-flight of the vehicle in the not too distant future. 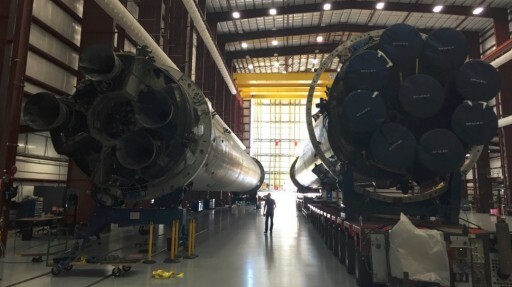 Musk initially stated the booster would refly as early as June, but the timeline for the first SpaceX re-use mission has been shifted towards the end of the year. First on the agenda for the F9-024 core stage will be detailed inspections to allow SpaceX engineers to better understand how the different components of the rocket fared during the hotter re-entry. This will point SpaceX to potential reinforcements that need to be made to the boosters for this type of mission to permit a re-flight with minimal refurbishment which is the overall goal to be achieved over the coming years. Whether F9-024 will be re-flown has been left open and will depend on the condition of the stage. For SpaceX, upcoming operations include the return of the Dragon SpX-8 spacecraft from a five-week Space Station mission, set for a parachute-assisted landing in the Pacific Ocean on Wednesday. Next will be the launch of the Thaicom-8 communications satellite penciled in for May 26 after a maintenance period on the Eastern Range. 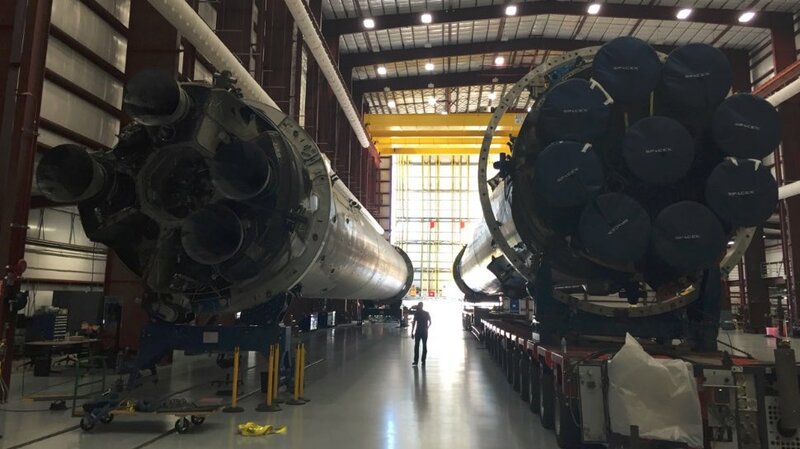 This will be a Supersynchronous Transfer Mission and provides Falcon 9 with an opportunity to demonstrate the repeatability of a high-energy return from the edge of space.